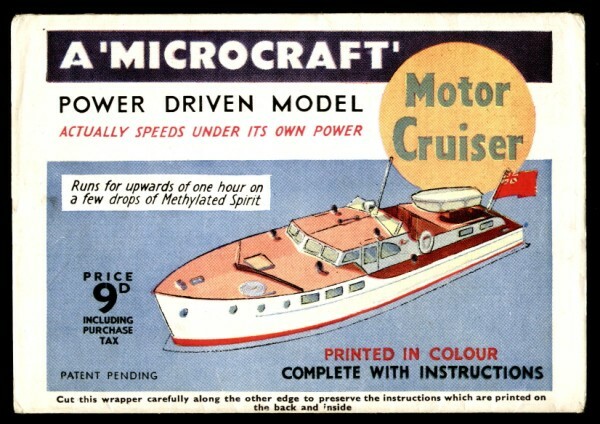 Description A ‘Microcraft‘ power driven model, the Thornycroft Motor Cruiser. The First and second editions were published around 1947 at 9d. 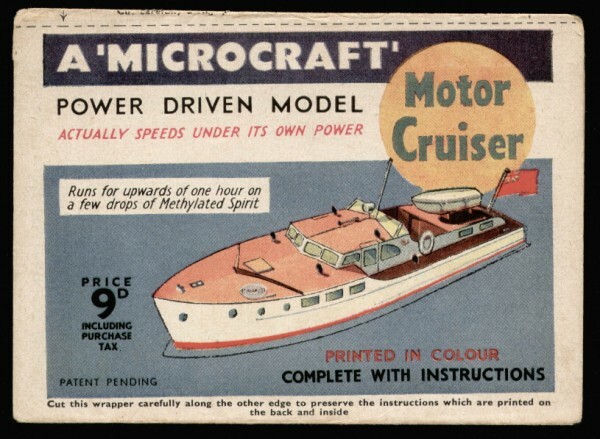 Third edition around 1955 at 1/-d. 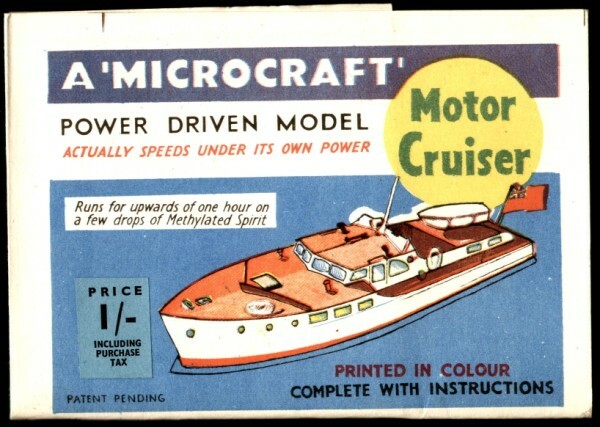 The first edition has the packet cut line along the top edge and on card two carries a description of the Motor Cruiser. 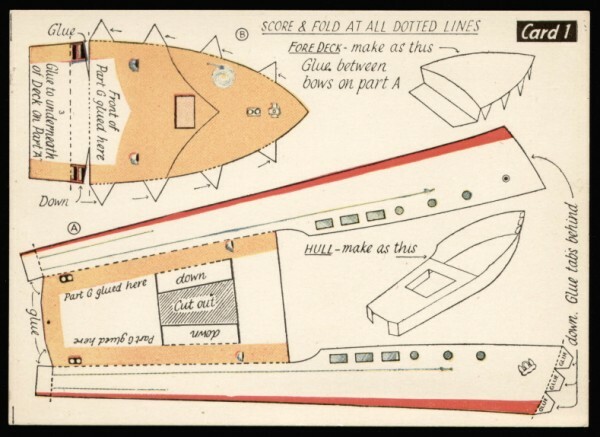 The second edition has the cut line along the middle of the packet back (only time this was ever done). 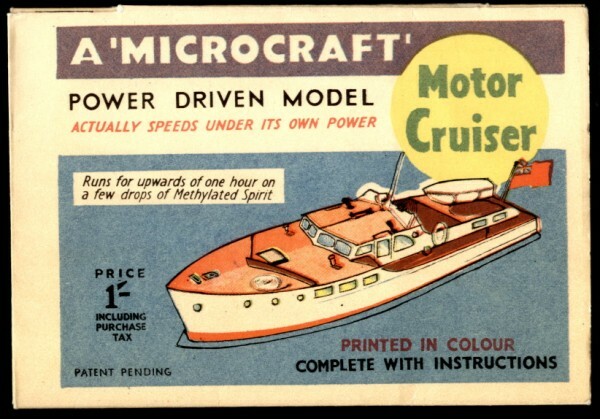 Card two carries no description of the Motor Cruiser. 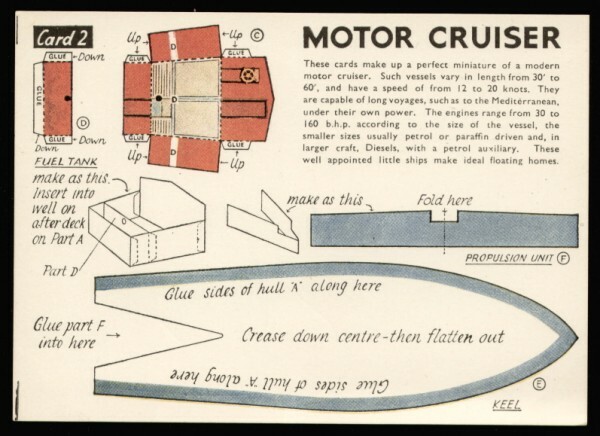 The instructions inside the wrapper of the second version are identical with the first version but have been re-arranged to allow for the unusual method of slitting the packet. The cards of the first and second editions do not have a protective finish. Third edition: Although the artwork remains the same, the presentation of this third edition is very different. Everything is on one sheet of card, size 22 x 37 cm. This card is protected by a wax finish. 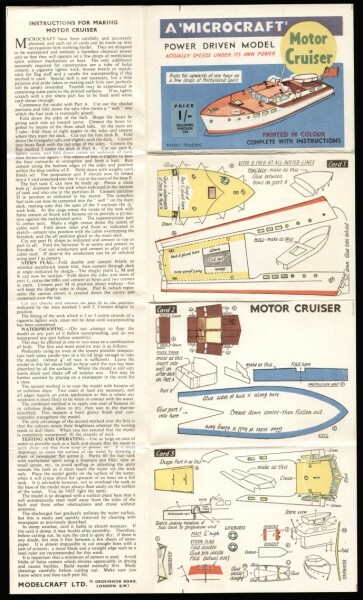 The sheet folds up to the same size as a micromodel packet, and features the same artwork and instructions, as editions 1 and 2, although the quality of printing is not quite as good. 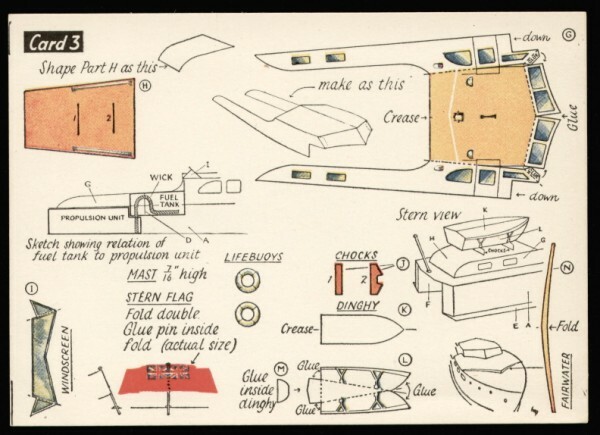 Presumably, this fold up design was intended as a money saving exercise in order to eliminate the collation costs of a normal packet micromodel. 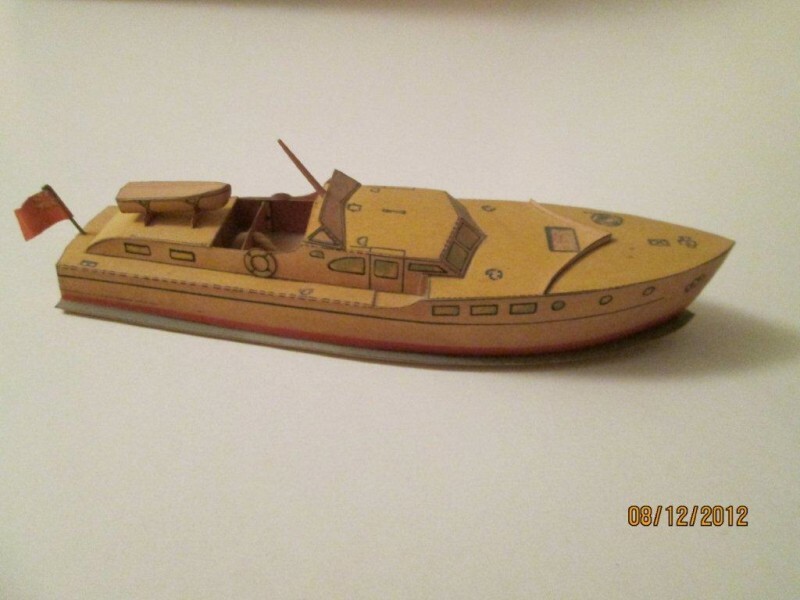 Just like the Queen Mary and the Thames Tug this model is designed to actually float and be self propelled using methylated spirits as a reaction agent. 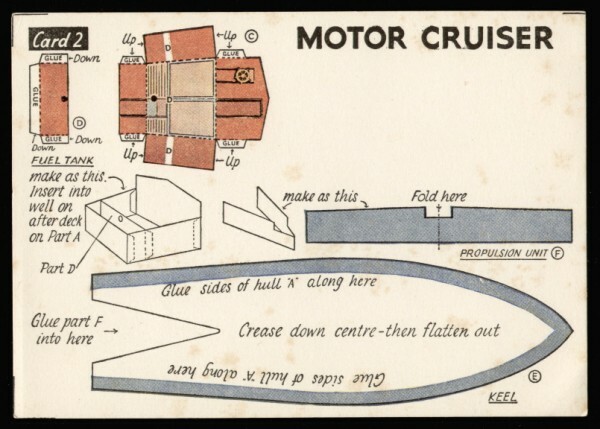 The Queen Mary and Motor Cruiser were exhibited as working models in a tank of water at the 1952 Model Railway Exhibition.